You are the voice of the Sjögren’s Syndrome Foundation and the reason for its existence. April is Sjögren’s Awareness Month and we want to help by giving you 30 ways to increase awareness through a different Sjögren’s fact or tip every day on our Facebook and Twitter pages. Awareness comes in many forms and we encourage you to follow us for the next 30 days and look for opportunities to talk about Sjögren’s and the SSF in your life. You can help make Sjögren’s a household name! #TipTuesday: Talking about your disease can help reduce the anxiety associated with a chronic illness, but the SSF knows how difficult that can be when friends, family and some physicians can’t even pronounce Sjögren’s (SHOWgrins). With an estimated 4 million Americans living with Sjögren’s, do the people in your life know how to pronounce it? 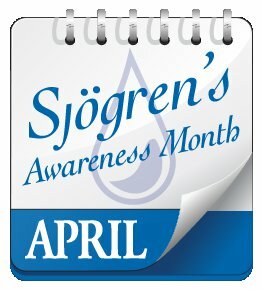 Please share this with your family and friends to help raise awareness of Sjögren’s this April!